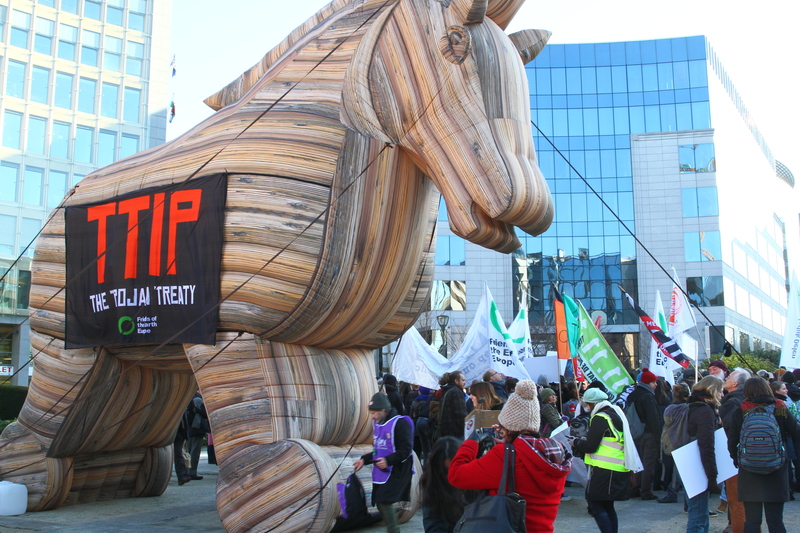 Copa-Cogeca and FoodDrinkEurope – representing EU farmers, agri-cooperatives, and food and drink manufacturers – are overall supportive of the controversial Transatlantic Trade and Investment Partnership (TTIP). But EU farmers are increasingly sceptical over America’s willingness to strike a fair deal. The next round of negotiations between the US and the EU will take place next week (19-23 October) in Miami, Florida. According to Eurostat, the US is the first export market for European food and drink products (worth €13.6 billion) and the second for European agricultural commodities (€4.4 billion). Conversely, the US is the third largest supplier of agricultural raw materials to the EU (worth €2.1 billion). Heavily hit by the Russian food embargo, European farmers see the EU-US trade pact as a chance to find alternative markets for their products. They are also convinced that American consumers will recognise the high quality of their products. But Copa-Cogeca also emphasised the slow progress made in lifting red-tape and non-tariff barriers during the negotiations. “Little progress has been made here but for us it’s vital to ensure a successful outcome to the free trade talks between the EU and the US,” said Peka Pesonen, secretary general of Copa-Cogeca. Speaking at a press conference in Brussels on Wednesday (14 October), Pesonen cited examples of EU fruit and vegetable exports blocked by the “costly and burdensome bureaucratic system of the US”. “A limited number of products are allowed to enter the US market after a pre-clearance procedure,” he stressed, adding that all EU products had to go through one single port, the port of Philadelphia. By contrast, US fruits and vegetables “can be exported quickly and reach all 500 million consumers via all ports” in Europe, Pesonen claimed. He also said that slow progress has been made over the recognition of the EU system of geographical indications, claiming that it protects EU products’ quality from imitation. Washington decided last week to put extra duties on EU butter and cream exports, a move that triggered strong reactions from EU dairy producers. “I question America’s commitment to free trade when it hits the EU dairy industry with increased duties on EU butter and cream exports,” Martin Merrild, the president of COPA, said during a recent visit (9 October) in the US. “I do not see the justification in this when we export only modest amounts to the USA […] like 8,000 tonnes of butter for example,” he added. Mansel Raymond, the Chairman of Copa-Cogeca’s milk working party, also expressed concerns over EU cheese position in the US market, as sometimes it could wait for approval up to 60 days. “EU cheeses are denied access to the US market because the label fails to use hairline, bars and bold type in an appropriate format,” he noted. Eleni Giannakaki, a communications manager at FoodDrinkEurope, told euractiv.com that the EU market share in the US had been shrinking in recent years – from 26% in 2001 down to 23% in 2010. “TTIP is a chance to reverse this trend and enhance trade between the two largest economies in the world,” she said. “We want an ambitious deal which will make it easier for the European food and drink manufacturers to trade with the US”, she said, making clear though that there would be no negotiation on maintaining the existing EU standards of consumer, environment and health protection,” Giannakaki said. Asked about food and drink industry’s “red lines”, she focused on the tariff field. “Solving regulatory issues and progressing on the tariff front will lower transaction costs for companies and speed up business operations. It also means that lower prices will make European products more attractive in the US,” she noted. “TTIP provides a great opportunity to focus on the elimination or reduction of burdensome and costly non-tariff trade barriers, including sanitary and phytosanitary (SPS) obstacles and other technical barriers, whilst maintaining high safety standards,” she concluded. In fact Yes the U.S. should release it’s restrictions on food and the unloading in only 1 port Philadelphia whilst Europe via all Port ! As a kind of protectionism: less imports more exports at the same time without to mention the duty fees infligations on E.U. products . The U.S. has to release a little bit . It’s just crazy the denial of cheese to the US market because the label fails to use hairline, bars and bold type in an appropriate format !! The E.U. could do the same but there is no real justfication for it .